Extensive charts list disease characteristics, for the age of the chicken, and lists diseases that are similar and gives reasons why it isn't the similar disease. It also lists remedies for those who want to make their own. This book has an extensive chapter on vaccines. Keeping Chickens Healthy -- Good Nutrition Means Healthy Chickens -- The Inner Chicken -- Mysteries of Metabolism -- What's Bugging Your Birds -- When Chickens Get Wormy -- Diseases Caused by Protozoa -- Conditions Caused by Bacteria -- The Fungus Among Us -- Diseases Caused by Viruses -- Management Issues -- Diagnostic Guides -- What's Going on Inside -- Treatments and Therapies -- Your chickens and Your Health -- Quick Guide to Diseases and Disorders. 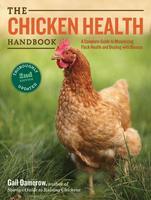 Chicken Health Handbook - Poultry, Chicken, Chook, Bantam, Hen healthcare.